Beth Ann & Jessica's Helpful Savings: 30% off at Gap, Old Navy and Banana Republic online TODAY only! 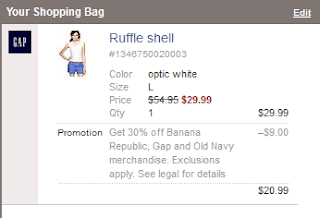 30% off at Gap, Old Navy and Banana Republic online TODAY only! Use code 24HOURS today only for 30% off your Gap, Old Navy or Banana Republic purchase. For instance, you'll get $9 off this Ruffle shell shirt in the clearance section. Go through Shop at Home for up to 9% cash back at Gap, 2% cash back at Old Navy and 3% cash back at Banana Republic.